Randolph College will host what organizers believe to be the largest collaborative musical performance in the College’s history on April 26. This year’s spring music concert will feature more than 100 performers—from Randolph and across the region, including high school groups, church groups, and several returning alumnae. The event, which is free and open to the public is scheduled for 7:30 p.m. in Houston Memorial Chapel. For Randall Speer, a Randolph music professor and director of Chorale and Chamber Orchestra, the show is the realization of a dream long in the making. The highlight of the evening will be the performance of Misa Azteca by California composer Joseph Julian Gonzalez. The work is a mass based on the rhythms and poetry of the Nahua peoples of Meso-America. This major contemporary work is for mixed chorus, soloists, pre-Columbian percussion, and orchestra, using Spanish, traditional Latin and Classic Nahuatl texts. Speer said a series of events led to the choice of Misa Azteca. After performing at Carnegie Hall in 2012, Chorale, Randolph’s student vocal group, was invited to perform in Greece. While in Greece in 2013, Speer and the group heard Misa Azteca. “I resolved then to bring it to Randolph,” Speer said. Alumnae and alumni of the College will be involved in all aspects of the concert, including the chamber orchestra, choir, and as soloists. Students from Lord Botetourt and James River High School choirs will participate, and the Court Street United Methodist Chancel Choir will also join the group for Misa Azteca. 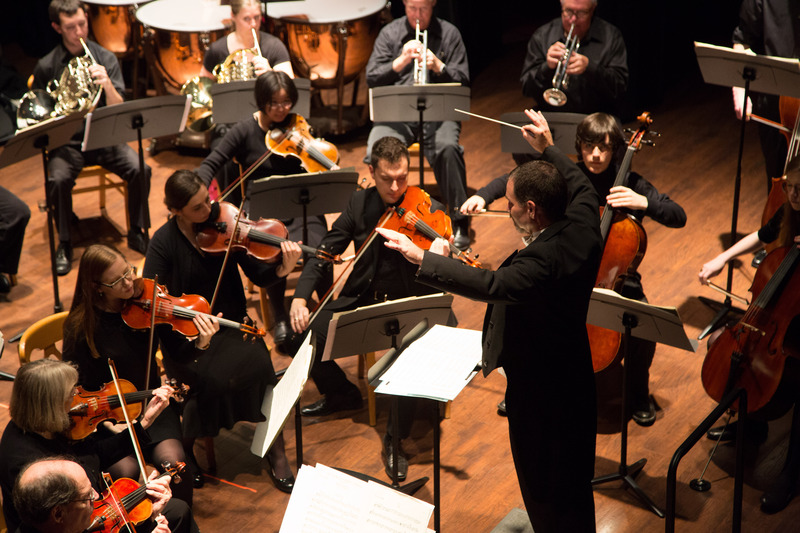 The April 26 event will also feature the chamber orchestra performing Sinfonietta No. 1 “A Memoria de Mozart”, by Brazilian composer Heitor Villa-Lobos. Chorale will also perform Missa Luba, a Congolese mass for chorus and African percussion. Soloists include Ayoyinka Oriola, tenor (Missa Luba); Christopher Swanson, tenor (Misa Azteca); Anna Womble Sterrett ’06, soprano (Misa Azteca); and Chelsea Fox ’15, mezzo-soprano (Misa Azteca).